Place the Amish Hardwood Small Mission Mirror in a bedroom or your hallway and watch it shine! This mission style furniture exhibits a simple beauty that has remained popular for years. This small mission mirror combines beauty and function to serve you daily! 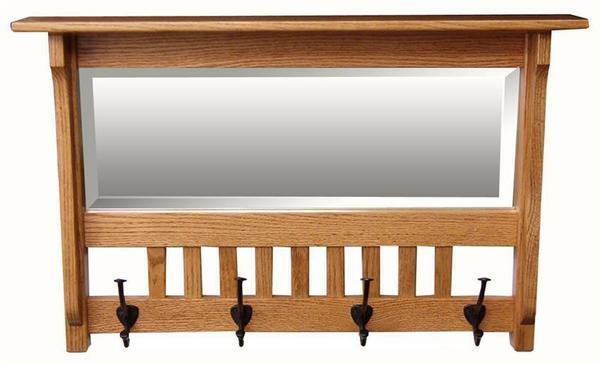 This Amish mirror provides four hooks that give you room to hang jackets, sweaters and more. Place one in the foyer to check your hairstyle before heading out and grab your coat as you go! Take a look at our Amish Mirror collection to see all that DutchCrafters has to offer. Customize your Amish mirror by selecting the solid wood you like the most. Call one of our Amish Furniture Specialists today at 866-272-6773 for assistance. 28.25" x 4" x 19"